Simeon Grimshaw was born in Yorkshire in 1855 and was married to Charlotte Harrison in 1879. Like many Grimshaws from that area and era, Simeon worked in the textile business. Simeon’s ancestry in the Yorkshire line started by Edward and Dorothy (Raner) Grimshaw (see companion webpage) has been established. Sometime between the births of their first (William Arthur Grimshaw in 1880) and second child (Elizabeth in 1884), Simeon and Charlotte emigrated to New Jersey, where they lived in Camden. In about 1891, the family (with two additional children) apparently returned to England. 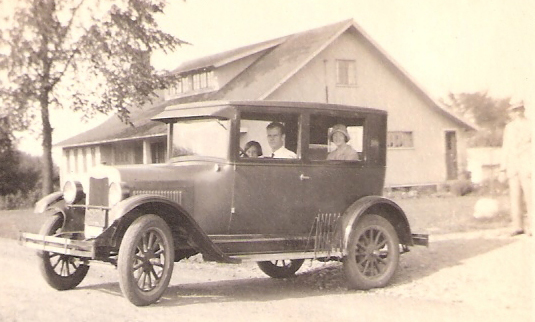 Nearly 30 years later, perhaps after Simeon had retired, the couple and several members of the family returned to America, where they settled at Lakewood, New York. Simeon and Charlotte apparently lived out their lives there and are buried together in Lakewood. Thanks go to Bob Facer for providing the information and images that have made this webpage possible. Thanks also to Daniel Biery for providing the picture of the clock that appears below. 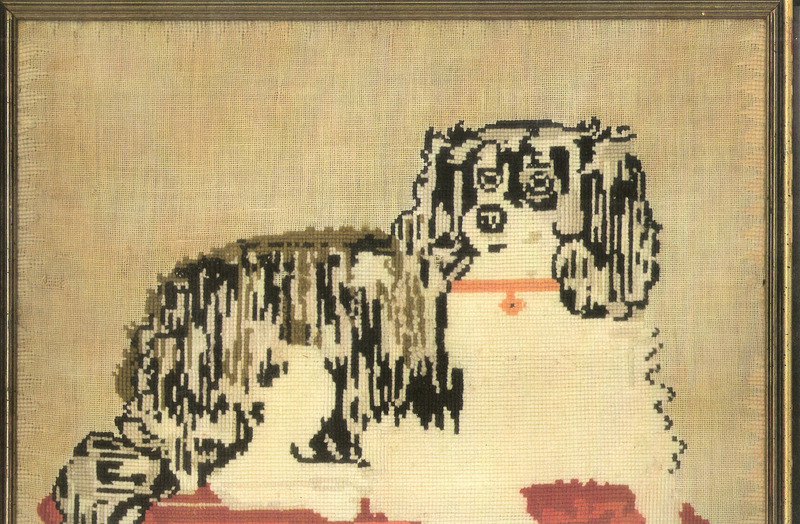 Charlotte dated the needlepoint piece shown below as 1878, which was the year before her marriage to Simeon. The piece is shown in upper and lower portions with overlap. The group photographs shown below of Simeon and Charlotte were generously provided by Bob Facer. Charlotte Grimshaw standing in center of photo. Simeon seated to the right of Charlotte on this photo. Lewis and Edith (Appleton) Grimshaw above and to the left of Charlotte. Frank and Elizabeth (Grimshaw) Brooks above and to the right of Charlotte. 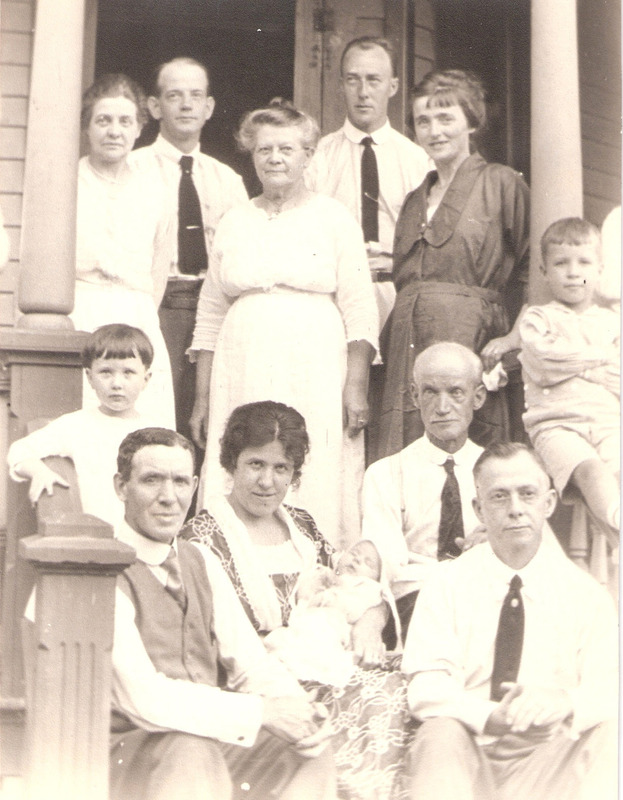 Adults and children in lower part of photo as yet unidentified. 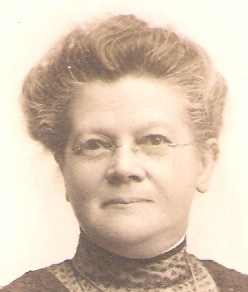 Elizabeth Grimshaw, who married Frank Brook, was the only daughter of Simeon and Charlotte; her photo is shown below. 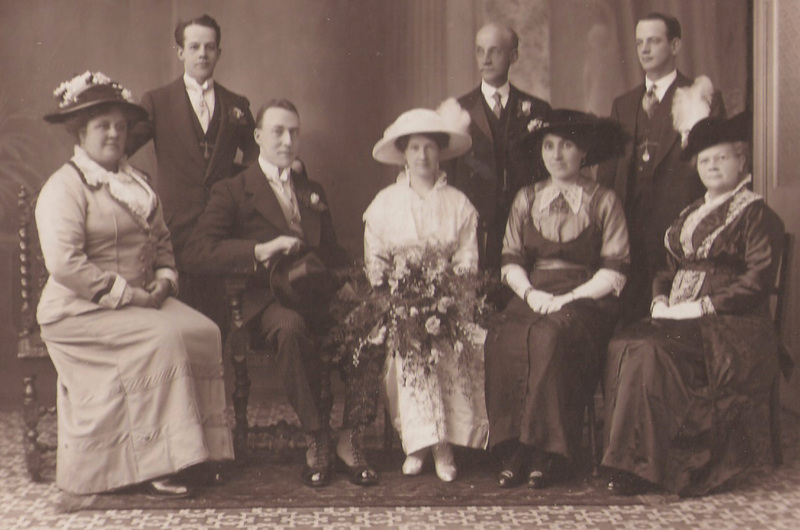 Also shown is a photo of the wedding party at the time of her marriage. Elizabeth Grimshaw and Frank Brook Wedding Photo, September 12, 1914. 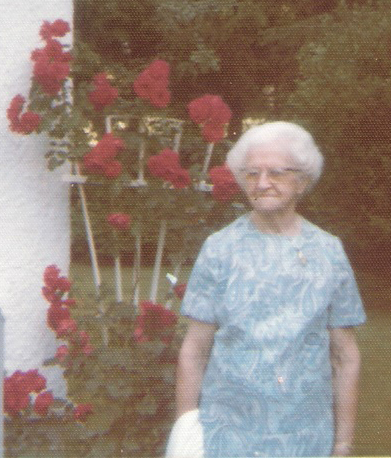 The photo below was taken of Elizabeth in 1974, when she was 90 years old. The 1881 British Census found Simeon and Charlotte Grimshaw living at 7 Almhouses in Shipley with their young son, William A Grimshaw. Simeon’s parents and siblings were at 3 Westcliff Road in Shipley. Images of the two census records are shown below. Possible associated with their return to America in 1920, Simeon and Charlotte received a U.S. passport while in London. An image of the passport is shown below, with the excellent photos Simeon (and his signature) and Charlotte excerpted and shown first. Interestingly, the passport indicates that Simeon (and therefore probably also Charlotte) had U.S. citizenship, which he (or they) may have obtained during their earlier immigration to New Jersey. 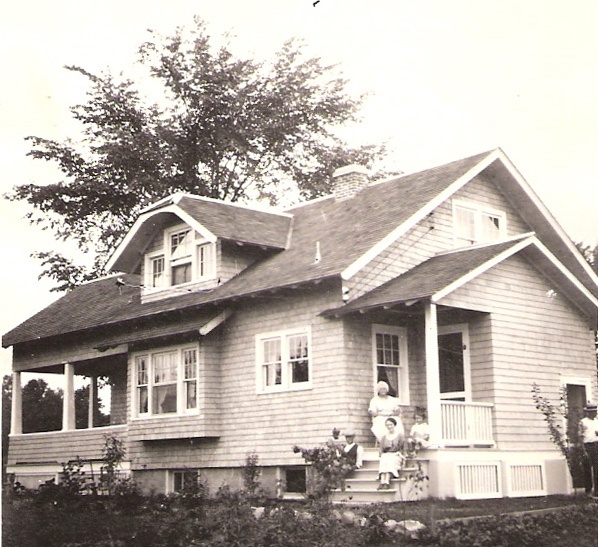 After their return to the U.S., Simeon and Charlotte lived next door to daughter and son-in-law Elizabeth and Frank Brook in Lakewood, New York. A photo of Simeon and Charlotte’s home is shown below. It is not known who the four people on the porch and steps, or the man near the right edge of the photo, are. 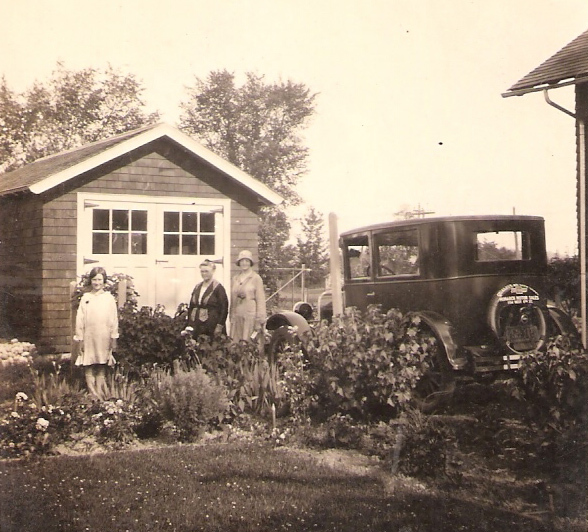 The photo below is of the garage between the two homes. 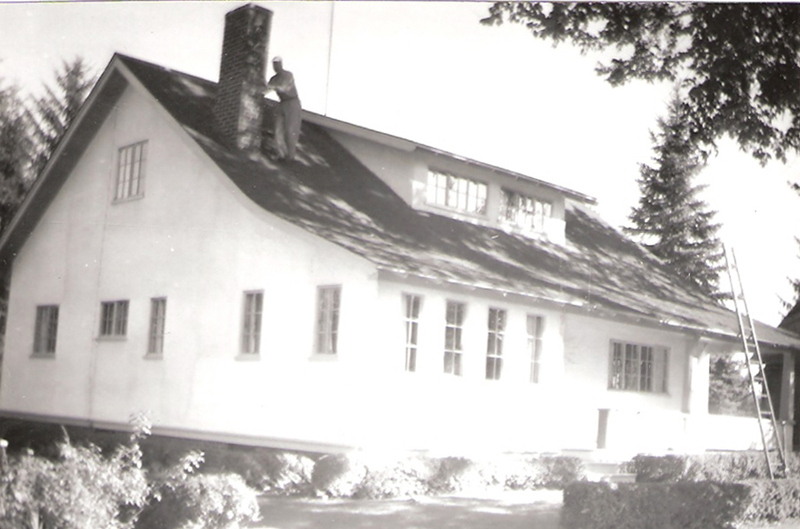 Photos of Elizabeth and Frank’s home are shown below. The expenses for building the home at 45 Bentley Avenue in Lakewood are shown in the following image. 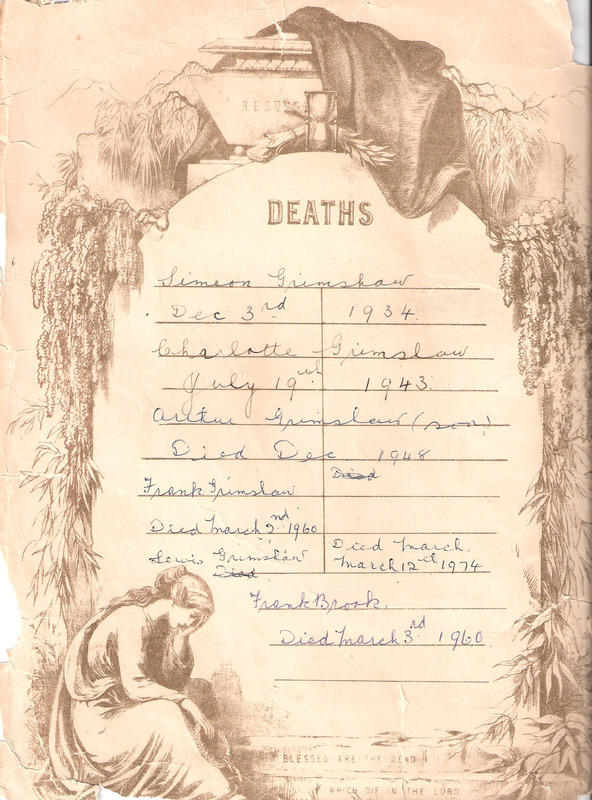 Two pages from the family Bible showing pertinent information on children and their death dates are shown below. The excellent handwriting is most likely that of Charlotte. Bob Facer has collected genealogical information on Simeon and Charlotte Grimshaw and their descendants, which is summarized below. 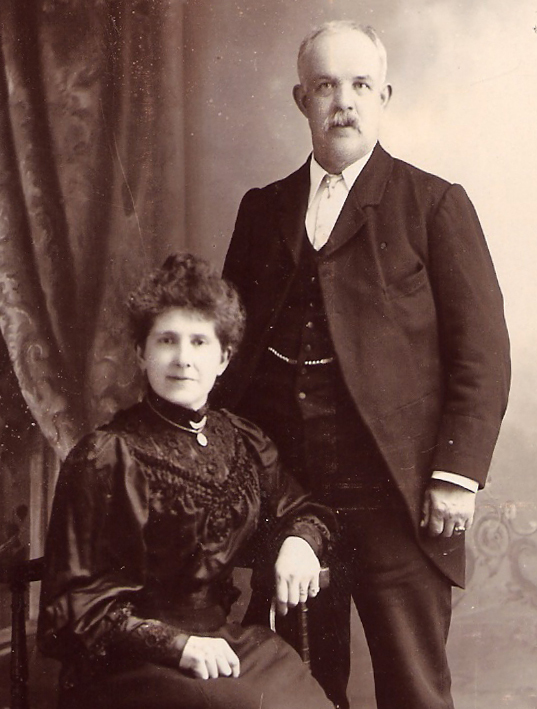 John Grimshaw (ca1829, Calverley, Yorkshire – Jun 1898) & Elizabeth Keighley (2 May 1828, Idle, Yorkshire – 18 Jun 1943). Mar. 23 Jun 1851. |–Simeon Grimshaw (5 May 1855, Calverley, Yorkshire – 3 Dec 1934) & Charlotte Harrison (13 Oct 1855, Bradford, Yorkshire – 19 Jul 1943). Mar. 11 Apr 1879. 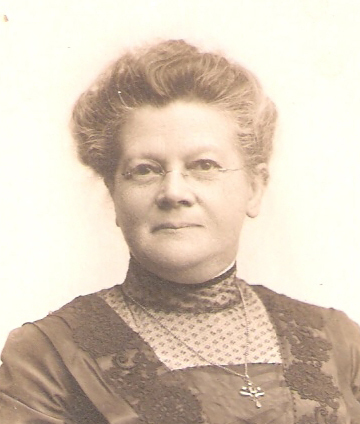 |–|–Elizabeth Grimshaw (20 May 1884, Camden, NJ – ?) & Frank Brook (? – 3 Mar 1960). Mar. 19 Sep 1914. 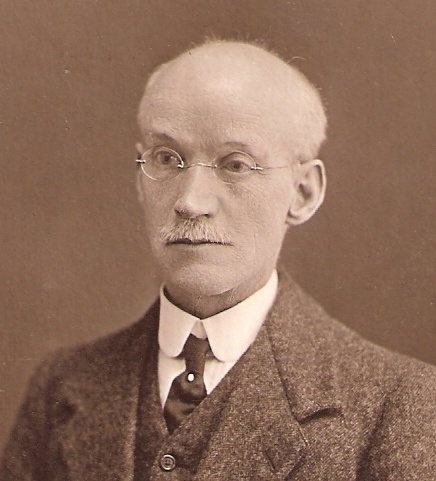 |–|–Frank Grimshaw 16 Apr 1890 – 2 Mar 1960). Never married. |–Herbert Grimshaw (1 Dec 1869 – ?). Mar. May 1890. 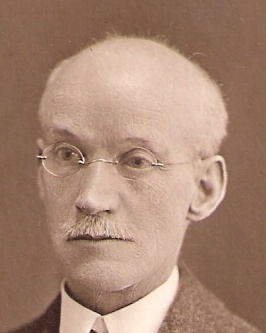 Simeon Grimshaw is among the descendants of Edward and Dorothy (Raner) Grimshaw, whose line was centered in the Calverley area nearLeeds in Yorkshire (see companion webpage). An abbreviated descendant chart showing the position of Simeon is shown below. 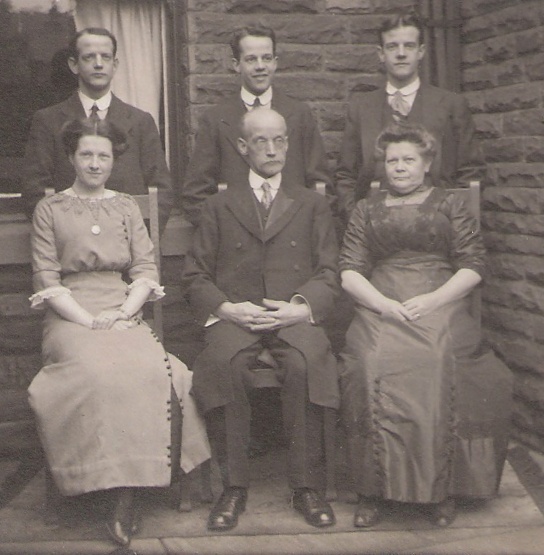 The photo shown below was provided by Bob Facer, who has reason to believe that it is of Simeon’s parents, John and Elizabeth (Keighley) Grimshaw. Thanks go to Daniel Biery for providing the photo of the grandfather clock shown below. 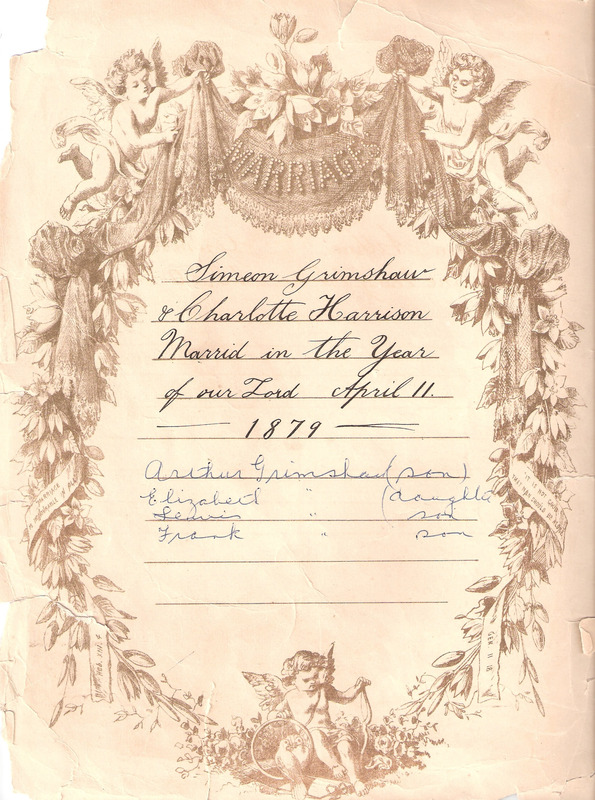 The following excerpt from Daniel’s email indicates the origins of the clock as a wedding gift in 1851, some 3 years before Simeon Grimshaw’s birth. My brother-in-law, Bob Facer, asked me to forward these pictures of the grandfather’s clock in our home. This was in Bob’s parents home and we were lucky enough to receive it when Margaret died. 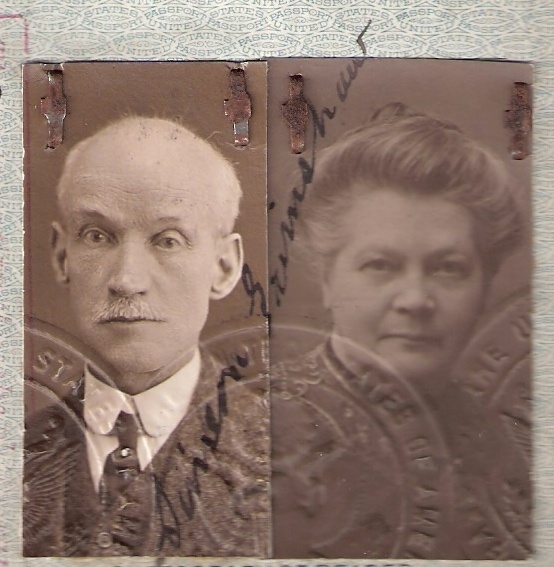 On the inside of the door was a taped card that states “Mother Brooks Paternal Grandparents at their wedding Clock”. 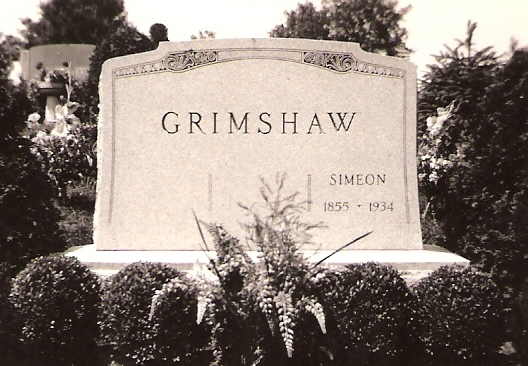 Simeon Grimshaw’s grave, probably in Lakewood, New York is shown below. The photo was apparently taken after Simeon’s death in 1934 and before the death of Charlotte in 1943.